The rock on the back of the newly expanded garage matches the rock facing installed 10 years earlier. A love of great Italian designs inspired this piazza for cars. Simple, however, is rarely easy. 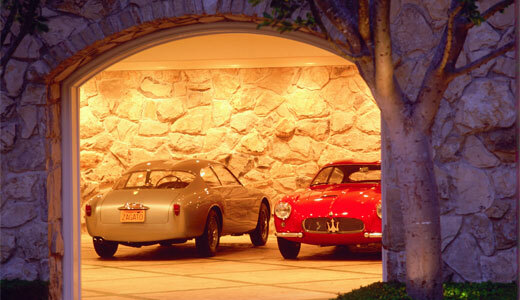 Especially when it resembles an Italian villa filled with 1950s and 1960s Italian classic cars. Touring David Sydorick’s recently expanded garage in California you are taken into the environment that you might imagine famed designers Zagato and Pinin Farina had planned for their specially bodied Alfa Romeos and Ferraris and Maseratis all along. Sydorick believes his garage is a frame for the masterpieces. Originally he built his house in 1980 with an attached three-car garage, plus a second three-car garage under the guest house. The second garage was later expanded to feed his growing passion. But even with seven doors and notably tiny cars, he ran out of room. The solution was a major remodeling. So major that he actually had to move a mountain. The expansion burrowed into the mountain behind the three-car space under the guest house. The new back wall of the garage is covered with large pieces of stone, which are artfully placed. “I picked out and placed all the stone,” says Sydorick. The supplier delivered palette after palette that Sydorick went through to pick just the right size stones for the walls. 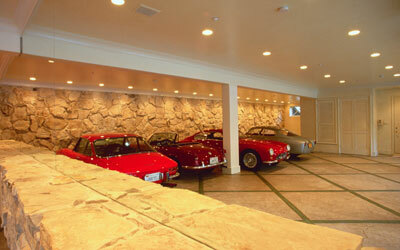 This rock ledge divides a mirrored wall that makes the garage appear double its size. The floor is pressed concrete, stained green between squares to mimic the grass on the outdoor driveway. The addition floors match the floors of the existing garages and the outside courtyard. It's a simple stamped concrete treatment, which resembles huge slabs of stone. © 2006 Ultimate Garages Promotions, Inc.